Opposition to globalization has expanded and energized in the U.S. by both the Bernie Sanders and Donald Trump campaigns. “Globalization” sounds unappealing, like throwing goods and traditions from around the world in a blender and chopping them up. Consumers appreciate lower prices but worry about factories closing and “jobs being shipped overseas” to lower-paid workers in Mexico, China, Vietnam, or India. Globalization, multilateral trade agreements, and “the international order” are regularly attacked by populists and nationalists in the US and Europe. And also in China. Studies rank China’s economy, the world’s second largest, among the most closed. From cars to wind turbines, Beijing limits foreign participation in domestic production. Citing “food safety,” Beijing insists that almost all grains consumed in China are domestically grown, and sets artificially high prices to support bumper harvests. State media touts locally made consumer products including bidets and rice cookers. The ministry provided $8.7 million for the research, which Beifa undertook with state-owned Taiyuan Iron & Steel Group Co., China’s largest stainless-steel mill. By September, the mill produced its first fully-domestic ballpoint pen. Fortune also runs a story “China Couldn’t Make Its Own Ballpoint Pens—Until Now” (Jan. 10, 2017), noting Chinese firms produce 38 billion ballpoint pens each year but import ballpoint pen tips from Japan, at a cost of $17.3 million a year. Premier Li Keqiang first drew the nation’s attention to the pen tip dilemma in January last year, lamenting that China still relied heavily on imported high-grade steel despite producing more than half of world’s crude iron and steel. State media reported that Li’s inability to make the tips reflected badly on Chinese manufacturing in general. The article says Chinese firms spent “half a decade of research” to produce the pen tips. So here is a problem with politically-directed nationalist policies. Divide the $17.3 million a year pen tip “savings” over 38 billion pens. Chinese firms making tips themselves may reduce costs by some part of $0.000455 (about 1/20th of a penny per pen). 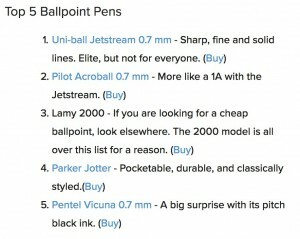 The Pen Addict reviews the top five ballpoint and other pens. The top rated ballpoint pens sell for $2.50 to $20 with $62 for the most expensive. Probably there are better ways for Chinese ballpoint pen engineers to focus their attention than on that learning to make their own tips. A key challenge for Chinese firms is developing brands people worldwide will recognize and pay more for. But brand recognition usually follows innovation and marketing, not politically-directed manufacturing advances. Here’s a little thought exercise: Think of a Chinese brand. Any Chinese brand. Go on, I’ll wait. Give up? Don’t feel too bad: According to a recent poll conducted by HD Trade Services, 94 percent of Americans cannot think of a single brand from the world’s second-largest economy. Strange, isn’t it? Japan and South Korea, countries China zoomed past in the GDP-rankings, boast globally-respected brands across a variety of industries. Even Sweden and Finland — mere minnows in comparison to China — offer IKEA and Nokia, respectively. Given China’s incredible transformation into an economic powerhouse over the past three decades, why doesn’t the country have more recognizable brands? A key problem with nationalist policies follows from politicians supporting domestic “champions”– state-funded or subsidized firms state officials hope will succeed in the global economy. But governments have a poor track record choosing the best firms to support. Japan’s MITI tried for years to stop Honda from expanding from manufacturing motorcycles to cars, in part due to influence by successful and established Toyota and Nissan. While President Xi defends globalization abroad, his nationalist policies favor state-run companies back home. Many foreign companies and governments say China unfairly restricts access to its markets while flooding markets with low-price exports such as steel, helping to stoke a populist backlash abroad against globalization. Rapid industrialization spilled pollution across China’s cities, rivers, and skies. Market-reforms in the 1989s opened first agriculture and Special Economic Zones (SEZs) like Shenzhen to local enterprise and overseas investors. Market reforms and factories then expanded across China, bringing pros perity but also pollution from mining and manufacturing. 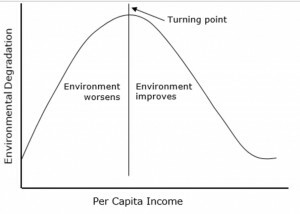 Through the first decades of reform, pollution seems far less important than jobs when wage rates even in 1990 average income per person (GNI) was just $330 a year. By 2000 average income had nearly tripled, but was still just $940 a year, and by 2015, average income was nearly eight times higher to $7,930. Hundreds of millions migrated from rural China to new assembly plants and textile mills. An estimated 200 million migrant workers still form the “floating population” of informal labor. The estimation results verify the existence of the spatial correlations in coal consumption across provinces, and there is strong evidence for the “inverted-U” shaped EKC relationship between per capita coal consumption and the GDP per capita. Besides, the GDP per capita corresponding to the peak of coal consumption per capita is estimated to be higher when the spatial effects are fully accounted for. Rapid industrialization in countries with weak rule-of-law institutions brings costs, including heavy pollution of the air and water. Early on, pollution was seen by most as a good thing, a sign of industrial progress, production, and rising wages and job opportunities. 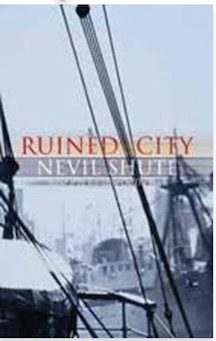 In Nevil Shute’s novel, Ruined City, a shipbuilding town on the English coast, whose companies had gone bankrupt in the Great Depression, is described to be: “as clean as a sepulcher,” (a small room or monument, cut in rock or built of stone, in which a dead person is laid or buried). The factories were closed so no more smoke and noise in the air, but also no more jobs and income. Laid-off shipbuilders and others were out of work, out of income, out of hope, and mortality rates soared (in the novel, a hospitalized financier arranges new orders to bring shipbuilding, and the city, back to life). Resolved: That the United States government should substantially change its foreign policy toward the People’s Republic of China. Attending an economics conference in Beijing in 1995, I had time between sessions to walk city streets and shopping areas. One street with vendors in small stalls offered books, movies on VHS tape, shivering dogs, and one stall with just a pile of coal. For maybe fifteen minutes I watched shoppers filling bags with coal to cook and heat their nearby Beijing homes. Most people of Beijing are far wealthier now and incomes higher. 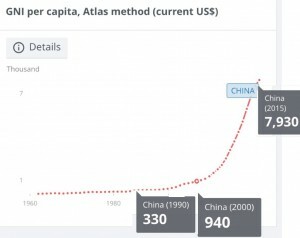 Average income in China is approaching $10,000 a year, but in 1995 average income was just $540. People in the cities are far wealthier, but not far from Beijing, households still burn coal to heat their homes. Increasing incomes and expanding access to inexpensive electricity is key to reducing Beijing pollution. But Ms. Gao, whose husband earns about $500 a month at an auto plant, soon noticed a downside. “Electric heating has become our family’s biggest expense,” Ms. Gao said. She said she may seek a job to help pay the bill. Despite electricity subsidies for residential consumers, villagers interviewed about their state-supplied heaters said their overall costs had risen substantially. Several said it costs around $300 to heat their homes for the winter, compared with about $200 with coal. The income divergence between city and rural families is extreme across China. “Here’s What China’s Middle Classes Really Earn — and Spend,” (Bloomberg News, March 9, 2016) shows in an income chart of China’s 770 million workers, just 19% are middle-income earning $11,733 a year. Another 31% are migrant workers earning an average of just $5,858 a year, and the rest are rural people earning an average of $2,000 (plus a .2% slice of the very rich at $500,000 a year). China’s migrant workers, the”floating population,” migrated informally (illegally) to cities for factory jobs. They earn more than they could in their rural villages, but Bloomberg reports: “food and clothing make up nearly half their personal spending” which is just $7 a day. Anything that adds to the cost of electricity pushes poor workers living around Chinese cities to shift to burning coal in their homes for heat. And this challenge highlights government spending and subsidies for expanding wind and solar power. Electricity from new natural gas and new cleaner coal power plants emit little air pollution (especially compared to families burning coal or wood at home). But both natural gas and new coal plants emit carbon dioxide as they generate electricity (burning natural gas emits about half as much CO2 as burning coal). …Thursday’s announcement was missing any language on curtailment, or the amount of electricity generated by wind and solar that never finds its way to the country’s power grid. In China, wind power curtailment was 19 percent in the first nine months 2016, Mr. Myllyvirta said, many times higher than in the United States, where curtailment levels are often negligible. The rapid growth in capacity has left China struggling to integrate power supplies from renewable sources even as the government continues to promote clean energy as an alternative to more polluting fuels like coal and natural gas. China idled 33.9 billion kilowatt-hours of wind power last year, up 69 percent from a year earlier, the NEA said in August. Idled capacity at solar farms has also begun to appear, especially in the nation’s northwest, it said. It is peculiar—though unsurprising given the sensibilities of Western environmentalists—that those who celebrate China’s “Green Leap Forward” almost always focus on wind and solar technology. By far the largest source of renewable energy used in China is traditional biomass—that is, people burning charcoal, firewood and dung, as China’s poor do to stay warm. Biomass is the biggest source of killer air pollution in the world. The Chinese government energy policy goals aim to reduce air pollution around Chinese cities, and also to reduce CO2 emissions to address climate change. These goals overlap, but are not the same. Wind farms and solar installations don’t emit air pollution, but neither does less-expensive natural gas combined-cycle power, which can be located closer to cities and customers. New coal power plants emit less air pollution, especially compared to the dense pollution from antiquated coal-fired power and home coal burning. China’s push to lead the world in wind and solar power combined a push for promoting domestic companies making and exporting solar panels and windmills, with a strategy to appeal to environmental organizations upset that China had become far and away the largest emitter of CO2. 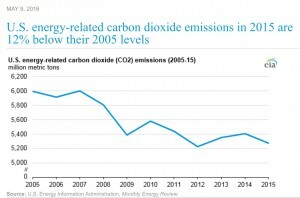 U.S. CO2 emissions have dropped 12% since 2005, according to the U.S. Energy Information Administration, but China’s CO2 emissions increased significantly over the same time. 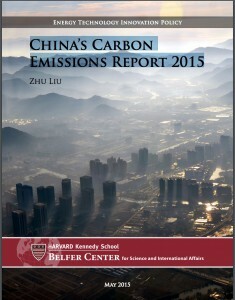 The Belfer Center report cover and first pages have images of heavily-polluted Chinese cities, but these show air pollution not CO2 emissions. China’s business and government leaders have long feared that influential environmental organization could join with US and EU labor unions, and protectionist manufacturers associations to enact new tariffs on Chinese exports, including carbon taxes (taxes on CO2 emissions), which would hit Chinese manufactured goods hardest. Now the new Administration and Republican-controlled Congress are dialing back on CO2 emissions concerns and regulations and at the same time threatening new tariffs on Chinese goods. So China’s strategy of major spending on wind and solar power to address CO2 emissions loses traction as a strategy to persuade environmental groups not to join US and EU protectionists. China may shift focus to expanding less-expensive electric natural gas power sources to deliver lower-cost electricity to the many still-poor households surrounding China’s cities and factories. Today, the Obama Administration has launched a new trade enforcement action against the People’s Republic of China at the World Trade Organization (WTO) concerning excessive government support provided for Chinese production of rice, wheat, and corn. [Admin. officials joined] by bipartisan members of Congress in announcing the complaint which challenges China’s use of “market price support” for three key crops (rice, wheat, and corn) in excess of China’s commitments under WTO rules. The U.S. government also subsidizes US farmers growing and exporting rice, wheat, and corn. Comparing farm subsidies across countries is complex. Iowa plays a key role in each Presidential election cycle because of the early caucuses lead other state primaries. And because corn is big business in Iowa, Presidential candidates usually call for maintaining corn and ethanol subsidies in their Iowa campaign stops. 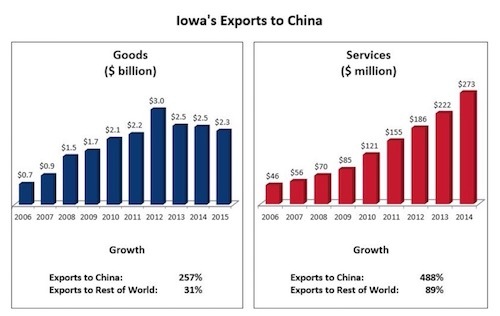 In 2015 Iowa farmers exported $1.4 billion in corn and other agricultural goods to China and Iowa exports have increased 257% since 2006. According to an “Agricultural Subsidies” (October 7, 2016 ) on Downsizing Government, the U.S. Department of Agriculture (USDA) spends an average of $25 billion a year on eight major farm subsidy programs. The amount varies depending on farm prices. 1. Subsidies Redistribute Wealth Upwards. 2. Subsidies Damage the Economy. 3. Subsidies Are Prone to Scandal. 4. Subsidies Undermine U.S. Trade Relations. 5. Subsidies Harm the Environment. 6. Agriculture Would Thrive without Subsidies. Crop prices fell in 2016 and Reuters reports “USDA to pay farmers more than $7 billion due to low crop prices,” (October 4, 2016). Though USDA and farm groups argue the federal insurance subsidies help provide just a “safety net” for farmers when prices fall, they encourage farmers to expand production, since they can expect to make money whether prices at harvest time are high or low (selling at market prices or at government-subsidized insured prices). 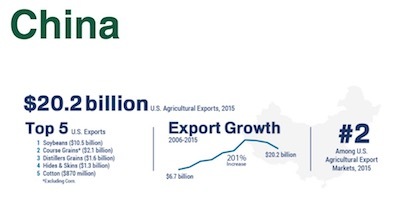 U.S. agricultural exports to China have grown more than 200 percent over the past decade and China was the United States’ second-largest international market in 2015. U.S. farm and food exports to China totaled more than $20.2 billion in 2015, led by soybeans, coarse grains, distillers’ grains, hides and skins, and cotton. So… what if both the US government and the Chinese government worked together to reduce or eliminate subsidies to farmers. US subsidies allow farmers to export corn, wheat, and other subsidized crops to other countries at artificially low prices. Subsidies also cost domestic taxpayers billions, and the money mostly goes to wealthy farmers. Chinese government farm subsidies similarly distort world markets and cost Chinese taxpayers billions. Iowa’s long-serving governor earned selection as U.S. ambassador to China by virtue of his long-standing personal ties to Chinese President Xi Jinping, which stretch back three decades. But how far does friendship go in managing relations between the world’s two most powerful countries? Branstad will soon find out in his new role. Though the Des Moines Register mostly discusses US/China geopolitical issues and the long personal relationship between Terry Branstad and Chinese President Xi Jinping, reducing and reforming farm subsidies would help rationalize commodity farm production in US and China, reduce environmental harms, and reduce financial burdens to taxpayers in both countries. Agricultural subsidies distort market prices and interfere with trade, causing deleterious distortions that adversely affect poor famers in developing countries and burden U.S. taxpayers. Moreover, in some cases agricultural subsidies can lead to environmental degradation. Reducing agricultural subsidies has the potential to help developing countries, the environment and taxpayers. The National Interest offers an “end of the world as we know it” scenario for a potential Trump Administration/China clash: “$5 Trillion Meltdown: What If China Shuts Down the South China Sea?” (July 16, 2016) Rex Tillerson’s Senate confirmation remarks, reported in “Rex Tillerson’s South China Sea Remarks Foreshadow Possible Foreign Policy Crisis” (New York Times, January 12, 2017) called for the US to get tough with China’s bases on South China Sea islands. But concern about oil and gas under the South China Sea is misguided. The key South China Sea issues are shipping and fishing. Future oil and gas should be considered a distant third. Since 2014, billions of dollars have been lost by around the world in deep sea oil and gas projects (“15 [oil] companies lost $21.7 billion in 2014“). Exploration and drilling projects started before mid-2014 expected $75 to $100 a barrel oil and similarly high natural gas prices. Oil was $114 a barrel in June, 2014, but dropped below $50 and has stayed in the $40-$60 range since. Surging oil from US shale drilling, increased oil from Saudi Arabia, Iraq, and Russia, as well as in returning Iran, all have production costs well below future undersea oil. Even without political risks, oil from under the South China Sea is less and less likely or relevant. Before the shale boom, the Chinese government believed oil shortages a key national defense issue. But that was ten years ago, when no one expected vast new oil and gas production from horizontal drilling through U.S. shale deposits. Shale has another advantage over undersea drilling: fast and lower start-up costs. A proposed project to discover and drill oil or natural gas from under the South China Sea would cost billions and take perhaps a decade to bring oil to market. Advocates for such a project need the money now but won’t have revenue for ten years. New shale well proposals can raise funds and start drilling in a few months. Plus hundreds of already drilled wells are capped and just waiting for higher oil prices (see: “Hoping for a Price Surge, Oil Companies Keep Wells in Reserve” (New York Times, December 25, 2015). Maybe some day oil and natural gas from the new “Saudi Arabia” under the South China Sea will be able to compete in world markets, but that day seems far, far in the future. …two-thirds of South Korea’s energy supplies, nearly 60 percent of Japan’s and Taiwan’s, and 80 percent of China’s crude oil imports flow through the South China Sea. 88,000 firms from Taiwan employ 15.6m Chinese workers. About 11m are employed at 23,000 Japanese firms or their suppliers. Throw in 2m more workers for South Korean enterprises, and companies from around the troubled East China Sea have approaching 30m Chinese on their payrolls. Tens of millions more in China work for suppliers to firms based in South Korea, Taiwan, and Japan. Plus Chinese firms are investing heavily in South Korea. See, for example: “China shovels investment into South Korea — entertainment, real estate big takers” (Asia Times, April 20, 2016). Strong economic ties between China, South Korea, Taiwan, Singapore, and Japan serve as a counterbalance to nationalistic urges and a history of conflicts. Chinese action to restrict shipping over the South China Sea would be economically and politically destabilizing, and I think as unlikely as major oil and gas production from under the South China Sea. But under these shipping lanes are the vast fisheries, which have collapsed due to overfishing. The good news is that South China Seas fisheries can be restored drawing from successful fisheries restoration and management in New Zealand, Australia, and other world fisheries. The second, and less-noticed, level is the regional one—that is, formulating and implementing regionally agreed-upon standards outside the established EEZ or territorial sea boundaries of littoral states. After all, fish are the only sovereign resources that stubbornly move between and among jurisdictions. To ensure that migrating species are not fished down to zero in regional high seas (so that there will be some fish left to swim into EEZs), UNCLOS encourages signatories to develop management measures in areas beyond an EEZ’s jurisdiction. • Fish caught in the South China Sea account for about 12% of the global annual catch. • The ruling from the U.N. Permanent Court of Arbitration effectively demolished China’s claim to the vast majority of the South China Sea. However, regional fisheries agreements based on top-down planning lack the institutional strength of quota-based systems like catch shares or TURFs. As of 2013, nearly 200 rights-based management programs exist worldwide, affecting more than 500 different species in 40 countries. Debaters of the ocean policy topic should be familiar with EDF and the success of catch shares systems in restoring fisheries. Shiyin assesses fisheries laws and policies and their implementations in Asian countries, particularly in China, and analyzes the possibility of using market-based approaches to achieve sustainability. She helps the Oceans Program launch fishing rights programs in China to reverse the decline of fish stocks and restore marine biodiversity. The Environmental Defense Fund has published a map of all catch share programs around the world. According to the infographic (click to enlarge), as of 2010 there were 275 catch share programs in effect worldwide, affecting 850 different species. New Zealand and Australia lead the world in rights-based fisheries, with 117 and 111 species under catch share management respectively. Canada, Chile, and the United States are also among the top five in species protected. Perhaps surprisingly, rights-based fisheries exist in countries ranging from Namibia (8 species) to Papua New Guinea (13 species). See the accompanying searchable database of catch share systems around the world. This Izzit.org video, Sustainable Oceans & Seas reviews the history and economic principles behind New Zealand’s recovery from collapsed fisheries 30 years ago. How to implement similar reforms to the contested South China Sea is a challenge. Sustainable Oceans & Seas – Full Video from izzit.org on Vimeo. There is no more important bilateral relationship than that between the United States and China. Yet the Congressional Research Service warns that ties have “become increasingly complex and often fraught with tension.” Relations appear likely to become even more fractious with the election of Donald Trump as president. Every four years the People’s Republic of China (PRC) becomes a presidential election issue, but Americans deserve a better explanation of the importance of U.S.-China political and economic relations than candidates’ sound-bytes. The Complicated Relationship with China. China is an emerging great power and perhaps eventual superpower that is challenging Washington in se veral key areas. The economic benefits for the United States of its relationship with China seem obvious, but many Americans wonder if the difficulties outweigh the benefits. The PRC possesses the world’s second largest economy and has become both commercial partner and competitor with the United States. Trade between the two nations is beneficial because of comparative advantage; that is, each country is relatively better at producing some items than the other. This economic concept is the foundation for trade throughout history. However, international commerce today is about politics as well as economics. Trade and investment disputes have multiplied between the two governments while China remains the fount of extensive cyber-espionage targeting U.S. business secrets. Continuing the relationship depends on the ability of the two governments to work through these often contentious disputes.